A word of warning: the video above may cause you to wince rather hard. 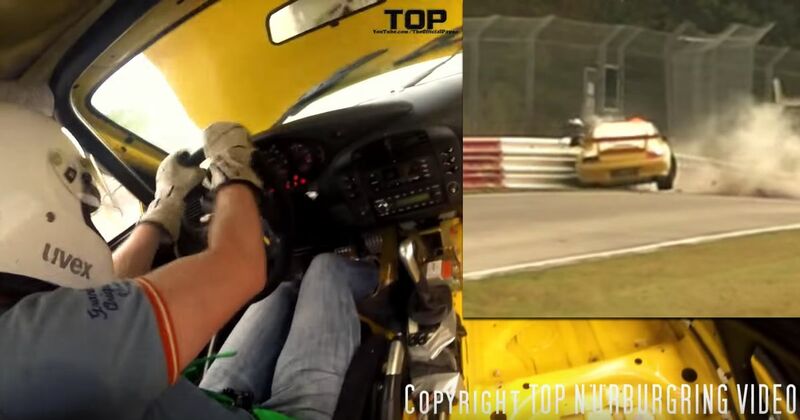 Taken at the Schwedenkreuz complex of the Nordschleife, it shows the moment this 996 Porsche 911 GT3 driver braked just after the crest - having seen a yellow flag - throwing the back end of the car out. The car soon makes contact with a barrier, and at that point, it’s clear the driver knows he’s a passenger. He takes his hands off the wildly spinning steering wheel to avoid further injury, waiting for the chaos to stop. Thankfully, he was uninjured in the dramatic wreck - which sent the flag-waving marshal darting away from the barrier - although the 996 GT3 was predictably looking rather worse for wear.